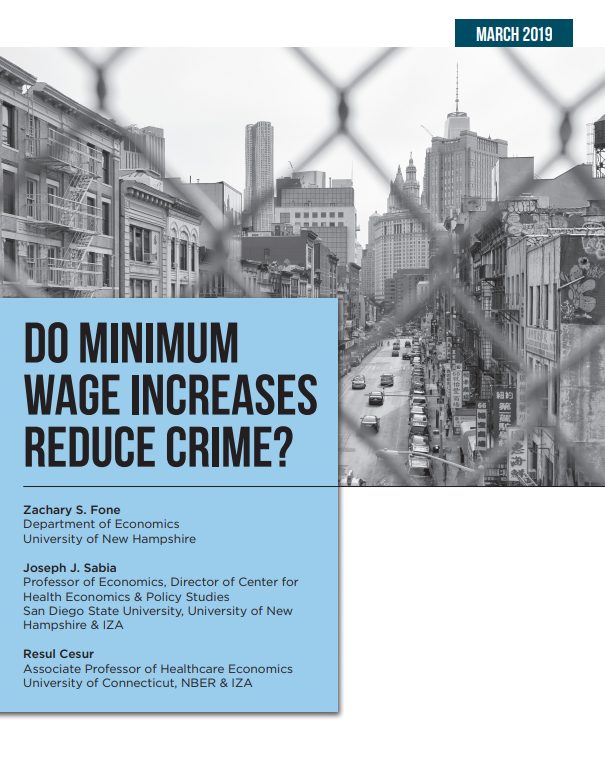 Home • Studies • Minimum Wage • Do Minimum Wage Increases Reduce Crime? Advocates have recently claimed that minimum wage increases may actually make our neighborhoods safer. By raising workers’ wages, the argument goes, legitimate labor market work will be more attractive to potential criminals and crime will fall. But what about those who lose their jobs? My new research, co-authored with Zachary Fone of the University of New Hampshire and Resul Cesur of the University of Connecticut, finds evidence that some affected younger workers turn to property crime, either due to excessive idleness or to replace their lost income. Higher minimum wages may, therefore, make some neighborhoods less safe. Our study examined two decades of data from the FBI's Uniform Crime Reports, the National Incident-Based Reporting System, and the National Longitudinal Survey of Youth 1997. We focused on younger, less experienced teens and young adults who make up a disproportionate share of the minimum wage workforce, and who are more likely to face the brunt of any increase. We examined various types of crimes including property, violent, and drug crime, and used econometric strategies designed to isolate the effect of the minimum wage from macroeconomic conditions or other policies. This allowed us to be sure we were not confusing correlation with causation. Our results are clear. Over the period from 1998 to 2016, we find that minimum wage hikes increased property crime arrests among those ages 16 to 24. This is precisely the age group for whom we find minimum wage-induced job loss. Specifically, we find that a 10-percent increase in the minimum wage is associated with a 2-percent increase in property crime. We find no evidence of an increase in violent crime, which could be consistent with an income motive. Applying our estimates to the $15 minimum wage proposal now before Congress, we estimate that such a policy shock could lead to over 410,000 additional property crimes, generating $2.4 billion in additional crime costs to society. This conclusion stands in stark contrast to a report released by President Obama's Council of Economic Advisers (CEA) in April 2016, which concluded that a minimum wage increase to $12 an hour would have led to a 3-to-5 percent reduction in crime. While we respect the team of economists working at the CEA at that time, the report’s conclusion unfortunately rested on the assumption that minimum wage increases would only generate wage gains without any substantial offsetting employment or human capital effects. Our study shows that these effects cannot be ignored. The adverse employment effects generated by a $15 minimum wage are likely to increase property crime among some young adults. Fortunately, policymakers need not grapple with the tradeoff of higher wages for some at the expense of fewer jobs and more property crime among others. There are policy alternatives to the minimum wage that better help vulnerable workers and are far better targeted to those most in need. Expanding the Earned Income Tax Credit (EITC) has been shown to increase income and reduce poverty for many vulnerable workers without the unintended consequences of a higher minimum wage. Because workers have to earn income to receive the EITC, it has the added benefit of boosting employment. It is also far better targeted to the working poor than the minimum wage due to eligibility requirements. Expansions in the generosity and eligibility for the EITC would be far a more effective anti-poverty policy than raising the minimum wage. Raising the wages of low-skilled workers is a laudable policy goal. But if a government mandated raise comes at the expense of a job – and induces young jobseekers to earn money through illegal means — then policymakers should look elsewhere for better solutions to reduce poverty.